On 6th December, Association Rural Development for Future Georgia (RDFG) organized a mid-term workshop under the EU-supported ENPARD project “Rural development for sustainable growth of Tetritskaro municipality”. 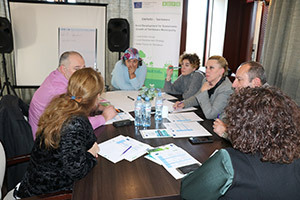 The workshop aimed to introduce the Project achievements to the rural development stakeholders, develop mechanisms to address common challenges and define joint actions for mainstreaming the LEADER approach in Georgia. 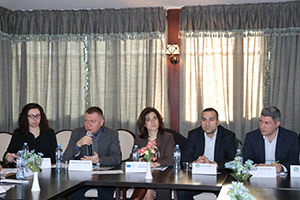 The event was attended by the Programme Manager for Environment and Rural Development of the Delegation of the European Union to Georgia, Ketevan Khutsishvili, as well as by the representatives of the Policy and Analysis Department of Ministry of Environment Protection and Agriculture of Georgia and implementing organisations of ENPARD rural development projects in Georgia. 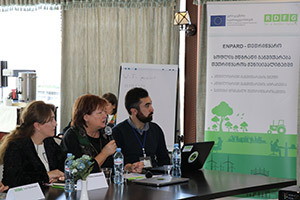 At the workshop, Association Rural Development for Future Georgia (RDFG) presented the progress of ENPARD project implemented by RDFG in Tetritskaro municipality, shared the project’s main challenges and lessons learned with the attendees from partner organizations and discussed the planned activities. In the framework of the project, Tetritskaro Local Action Group (LAG) was established consisting of 94 representatives from public, private and civil society sectors. Based on the European LEADER approach, LAG members elaborated multisectoral Tetritskaro Development Strategy and together with RDFG awarded EU ENPARD grants to 37 local rural development initiatives selected in compliance with the municipal development strategy objectives. In addition, DCFTA (Deep and Comprehensive Free Trade Area Agreement with the EU) information and resource DESK was established at Tetritskaro LAG office. The desk has already provided consultations to 103 local farmers on how to bring their production in line with European standards and gain access to European market. At the meeting, representatives of the Ministry of Environment Protection and Agriculture of Georgia spoke about the Rural and Agricultural Development Strategies and respective Action Plans for 2018 and beyond. In addition, the representatives of UNDP presented ENPARD III Project and reviewed its ongoing and future activities. At the event, representative of the RDFG’s project partner organization “Local Action Group network of Lithuania” Violeta Jankauskiene spoke about the importance of LAG networks and transnational cooperation and shared Lithuanian experience with the attendees. 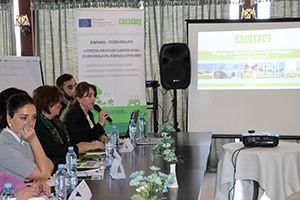 In addition, Georgian Association of Local Action Groups (GALAG) and Georgia’s Rural Development Network (GRDN) presented their planned initiatives and future plans. The event was concluded with a group works aiming to facilitate open discussions between participants and to develop new, innovative ideas and approaches to shared challenges in rural development. Main topics of the discussion were: Long-Term Sustainability of LAGs, LAGs networking and international cooperation, role of LAGs within the Rural Development Strategy of Georgia and in the non-governmental local development processes. The attendees of the event developed the list of the activities aiming to promote LEADER approach in Georgia and support sustainability of LAGs. The event participants also agreed that in close cooperation with the implementing partners of rural development programmes and Georgian LAG association, RDFG will organize additional workshops to discuss elaborated initiatives and develop action plan for their implementation. Project “Rural Development for Sustainable Growth of Tetritskaro Municipality” is implemented by Association Rural Development for Future Georgia (RDFG) with the financial support of the EU within the second phase of the European Neighborhood Programme for Agriculture and Rural Development (ENPARD). The project partners are Agro-Technology Association (ATA) and the Lithuanian Local Action Groups Network (VVTG).